Old coolant can become acidic and eat away your expensive radiator, head, and engine block. Acustrip for Dexcool (extended life) or Conventional coolants can give you early warning of problems. Simply dip an Acustrip into your coolant. The test patches on the strip will change color. Use the color chart below to determine PH and coolant concentration for Dexcool, or Reserve Alkalinity and concentration for conventional anti-freeze. If your coolant tests out of range, then you should drain, flush, and refill your system. Don't take a chance...make Acustrip a part of your annual checkout procedure. Use it for all your cars! Each strip is good for one use. Interpreting D-Acustrip. Dip the strip in your cooling system header tank (engine cold). Allow it to stay in the coolant for a second or two. Shake it off, then compare to the charts below within one minute. Your coolant should be around PH 9. If it becomes acidic, then copper and aluminum components will be in danger. Less likely, coolant that becomes too alkaline can also be risky. For conventional coolants, the strips read Reserve Alkalinity rather than PH. This is a measure of how much acid can be disolved in the coolant before it becomes harmful. 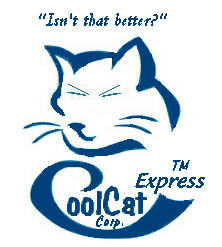 CoolCat is the only place you can buy this item in single-test quantities!